The leading warehouse identification and marking specialist with a unique approach to warehouse labeling, location signs and floor striping projects. Each warehouse label leaving ASG Services is different from another in design, content, color, material, and more, making them unique. Specializing in custom design, in-house production and fully managed installation projects throughout the US, serving customers with products and services. Barcode labels, signs and striping installations are complex projects which ASG Services specialize in from preparation to completion throughout the US. As a leading provider of warehouse location identification products and installation services, we are asked questions which are relevant to particular facilities, as well as those which are more common across the various sectors of storage and distribution. Here are some of those we can share with you. Are laminated labels worth the extra cost? If your rack or shelf locations cannot be reconfigured, or the location references are to remain the same for the duration of the facility, then yes lamination is worth having. Lamination adds to the durable nature of our rack labels, it helps protect the print and creates a thicker label which is less susceptible to damage. It does not protect against forklift or pallet impact though! Can I have check digits? Yes, these are a common request from our customers looking for pick accuracy improvements. Are your guys trained and insured to work in my building? In short, yes. Our teams are trained in-house and with the relevant external training centers to ensure they know how to do their job and how to do it safely. Any employee who we feel is endangering the safety of others is dealt with swiftly. Can I order blanks and labels separately? Yes, we supply all component items so customers can finish the signs themselves. It is rare we are asked but we appreciate that customers like to self-customize. Do you carry out installations in new buildings? Yes, in small and large buildings. We are well versed in working around other contractors on new builds. A wide lines are typically more durable. If you designate areas by line width. How high should I hang my new signs? Signs should always be placed at sufficient distance from sprinkler heads to ensure the diffusion is not altered or prevented by the signs or rails. If hanging the signs above, this is not an issue. The signs will need to be higher than the highest stacking point, but you should consider here that if the signs are hanging behind the front edge of the stack, they will need to be higher still, due to the angle of sight. Most modern scanners are equipped with long range scanning components, however this should be checked with the manufacture/supplier. If you want to test the distance before ordering, you might consider requesting a sample to perform on site tests. In a simple explanation, the wider a barcode is, the greater the distance it can be scanned at. Having a wider barcode will need a bigger sign, resulting in a more expensive product. Unfortunately this is highly dependent on how busy your operation is, the size of the project, the method of preparation and scale (or proximity) of the lines to each other. How far away can I stand and scan them? 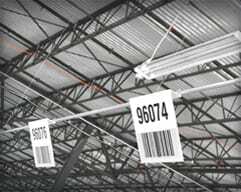 Warehouse barcode signs are location signs equipped with long-range material used to print the barcode on. The material allows the user to stand around 49ft to 65ft away and scan the barcode with ease, if their hardware is equipped with the relevant components. How long will it take for me to get my signs? Lead times are variable, owing to quantity, complexity and production volumes at the time of order. We prefer to work swiftly with every order since we never know the scale or quantity of the next, so you can be assured that we will not delay the process once your order is placed. We do typically aim for a 1-2 week turnaround from order confirmation. How much room do you need when installing? Depending on the scale and access requirements we may be able to working without effecting your operation, or we may need to provide detailed work plans which show how much we can do, where and when. The project team will also detail access requirements and safe working areas to be agreed and confirmed with the customer. I have a design already, can you copy it? Yes, if we have a sample or measurements and a good image we can copy your label almost exactly. I have an idea of how I want the sign to look, can you create a sample so I can test it? Absolutely, we would be happy to do with this with any order. I know the location references I want to use but don’t have a file containing them, can you help? We can create one from scratch if needed, there is a cost for this but we keep it low to ensure it is a cost effective alternative. I want to change parts of the layout, what will I need to do? During an installation you can let our team know, they will get your requirements and pass them to the projects team who will re-plan and price accordingly. After an installation, again just let us know, we can remove, cover up and install during the same visit. It’s not the end of the world but there will be cost. I want to drive over the labels, will they be ok? Yes, but we advise that you do not turn on them or scrape pallets across them. The labels get dirty and I can’t scan them, what can I do? 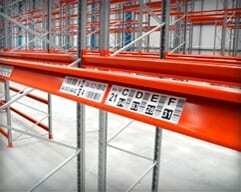 It is essential to have a clean warehouse floor if you are operating a floor label ID system. Labels can be cleaned, but will not withstand strong chemicals, which is why they are produced and priced to be a consumable item. Aluminum framed labels would be a better product if your floor is dirty, but any label on a dirty floor will have dirt on it at some point. Our safety team has found problems with slip hazards, what can I do for us? We have several options including mating, adhesive and none adhesive anti-slip products and anti-slip coatings, all designed for specific uses and varying durability. Yes, simply because the raw materials we need to create color labels are more expensive, however once an order is over a certain size, the extra cost becomes negligible. Is there a best fit design? There is always a best fit design, but a best fit for your facility is key to making your operation efficient, but not necessarily the same for another. We are able to recommend ideas from previous designs, from knowledge and experience in the industry, as well as samples for you to test. Most customers have an idea of what they want or need, if we think there can be improvements or something has been overlooked, we’ll let you know and discuss the details. My labels will not stick, what can I do? It depends on several things, the cleanliness of the surface, the surface texture and temperature. The surface must be free from dust and dirt, oils, cleaning solutions and moisture and any coatings which are loose. The surface texture is important, for example standard adhesives will not stick to an unfinished wood surface or a galvanized surface where microscopic elements prevent the adhesive working. Additionally, a surface which is very uneven, like a rough plastic mold finish, does not provide enough flat surface area for the adhesive to bond. Finally, temperature can affect the adhesive. In very cold environments, including chillers and freezers, the elements of the adhesive begin to freeze. Fortunately they do not neutralize, so once warmed they can be used. My guys have lost/damaged/positioned the labels wrongly. Can I order replacements? Yes, let us have the location reference(s) and we’ll get them out to you as quickly as possible. If you install the labels, what assurances can I expect? Every label will be in the correct place. Labels applied to the rack or shelf in a consistent manor for a uniform presentation. If you have missed information from your location references, our teams will report back to ensure they are made and on site before the facility goes live, and hopefully applied before we leave site. Barcode performance and verification guaranteed as an additional service. What color options are available? Almost any color can be supplied in board and character material. Customers looking to match company brand colors or a previous scheme can be accommodated with a huge range of color options to choose from. For those looking for more intricate designs or information and diagram signs, colors are unlimited. We utilize digital print technologies for these which are almost limitless. What colors should I use? ● “DANGER” – Red, or predominantly red, with lettering or symbols in a contrasting color. ● “CAUTION” – Yellow, or predominantly yellow, with lettering or symbols in a contrasting color. ● “WARNING” – Orange, or predominantly orange, with lettering or symbols in a contrasting color. ● “BIOLOGICAL HAZARD” – Fluorescent orange or orange-red, or predominantly so, with lettering or symbols in a contrasting color. Most work carried out by ASG Services is done with yellow and/or white. Occasionally we will be asked to use red, green, blue and grey. If in doubt ask what we can provide, almost any color is available. What design or layout should I use? The options are endless, so it really comes down to the information you want or need to provide, also the space available, your budget and how easy you want to make location identification for your team. To save time reading 2000 words on label design, call us to discuss your situation so we can recommend a best fit. Visit our warehouse labeling pages for more information or our online store where you can purchase online. What designs can you create? We are not a graphic design studio but we are capable of designing any label layout required. Variable content data and multi field options are possible, our only restriction on the number of barcodes and characters is the size of label you request. We will always suggest a size which best suits your requirements. What do you need to provide me with a quote? Quantities, sizes, location, aisle widths, beam heights, building operation status, start date and a thorough conversation so we understand exactly what you are hoping to receive from us and to achieve from using a company like ASG Services. What information do you need once I place my order? This is potentially a long answer, however to make things a little more simple… We ask for a list of location references or sign data to be provided, ideally on an excel spreadsheet. In addition, we would ask for any drawings or design ideas you have, based on the quotation you received. If you change your design idea and need a new quote just ask, it’s better to ask before we start production. As well as the information to create your signs, we’ll also need payment and/or invoicing details, a delivery address or site address for a warehouse sign installation. What is the toughest floor label? We are able to provide floor labels which are embedded, meaning they are less likely to become damaged. They are not cheap and they must be cleaned regularly, but they can withstand steel stillages being dragged across them, which is the most damaging action we could test against. From these you move to the metal frames to protect the adhesive labels, then our adhesive floor labels. What is your minimum and maximum order quantity? Order quantities are irrelevant at ASG, we treat all orders as a customized requirement. We do have a minimum order value in dollars, but this is nearly always irrelevant. What preparation is best for my warehouse? Preparation helps improve durability, so if you are operating a very busy facility or moving items which are heavy you will likely need a preparation method. There are several options, for heavy traffic areas consider embedded striping, for high traffic consider shot blasted, for general and low level traffic it may be possible to use an epoxy directly on a cleaned surface, however this has a low durability rating as with tape. It is typically more cost effective to have a preparation method when compared to several years of recoating and touch ups which will be needed. Every order we fulfill is customized, therefore, you name the size and we can provide prices and products to suit. What sizes do you supply? All products from ASG Services are custom made. We can supply any size, color and content required. Our online store lists stock sizes, for those looking to purchase basic items. When should I consider re-coating work? You will find that recoating is only needed where lines are driven over or turned on. 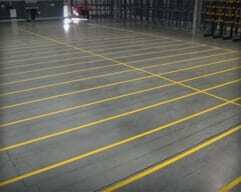 Lines along the length of bulk storage lanes for example, typically remain as good as when they were installed. Striping applied directly to the floor in busy areas may need a recoat within the first month or two or typically the first year, shot blast prepared lines 3 to 5 years and diamond shaved around 5-6 years. These however are estimates and not based on a specific type of facility. The barcode you choose to use is dependent on your location or product reference data requirements. Although we are able to produce almost any barcode type you require, Code 128 is by far the most requested by the storage and logistics industry. This is impart due to the range of characters which can be used (128), being all digits, characters and punctuation and because of its data to size percentage, lots of data can be stored in this narrow width barcode. Code 39 is the next most popular, which is less useful in terms of characters it can encode, but it is great for its simplicity and ease of scanning capabilities. This is often used with operations handling product specific references and a need to work quickly. More recently we have been asked for DataMatrix and QR Codes which can contain huge amounts of data compared to linear barcodes. Which floor labels can I use in a freezer? Our adhesive floor labels are supplied with an adhesive which can be applied in freezers. We recommend you clean the floor surface as best you can prior to application and take the labels into the freezer once you are ready to apply them. Why does label material matter? Put simply, polyester and polyester composite label material is more durable which prevents barcode distortion during application and shrinkage over time. It also makes it much easier to remove the label, from time to time you may want to re-label your locations due to configuration changes or WMS changes, polyester and poly-composites can be removed without tearing, unlike vinyl materials. Why should I consider integrated markings? 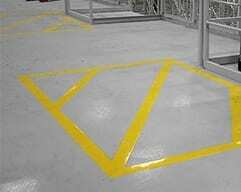 Combining your storage markings with passageways or safety markings can help save money. This comes from shared demarcation boundaries and downtime during installations. Why should I consider the more expensive option? The simple and short answer is durability. The more durable the line striping is, the less it will need to be reworked, so spending more now means saving even more later. It is true that location labels do not need color to work, but we recommend color to help the users identify key location information quicker. This may be as a level indicator where each level in a rack face has a unique color, so as the operative looks up, they can distinguish the level quickly and shorten their reading time. Color is also useful as a zone identifier particularly with floor locations, aisle groups in racking and shelving is another. Some customers use it for aesthetics for their in-house branding. Will I need to give you a drawing? How detailed should it be? For the most accurate price and planning, it is best to give us as much as possible, but it’s not essential, we can visit site and create a basic depiction for you for a fee. Having a drawing helps you visualize and us to plan and quote. Will your floor labels get damaged? Yes, floor labels are the most susceptible ID label in the warehouse, but they are tough and if used correctly can be extremely cost effective. We advise users to place the label to the left or right of a location entrance to help avoid continual impact, and where possible, that pallets and forks are lifted clear and that truck wheels are not turned while the wheel is on the label. You can drive over our labels all day, but like aluminum, frames and steel plates, if they are impacted unduly, they will fail. You did our facility in OH and we have another opening in PA, can we get the same type of signs for that site? Yes, we can retrieve information from our archive and apply this to your new location references, effectively replicating your previous warehouse identification system. You made signs for my building a few years back, can I get replacements? 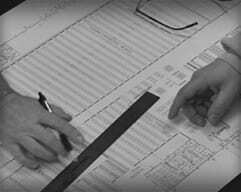 Yes, we operate an archive system so your previous orders including designs, location references and other documentation will be available for retrieval. Where do your installation services cover? Most of our installation projects are US based, but we also travel throughout the world with customers who know and trust in our services. We also partner with similar suppliers around the world, so we can often refer you to a company closer to you if needed. What dimensions are typical in warehouses? The most common dimensions are in walkway widths (4ft), pallet lane widths (pallet type dependant plus the line width) and line widths (4”), but every facility is different and may need custom sizes. Do you carry out sign installations in existing facilities? Yes, this is a specialty of ASG Services. Working in and around a fully operational distribution center can be daunting, not to mention it having a significant impact on productivity. Our teams are very experienced in how to work within these facilities and appreciate that the customers work ultimately comes first. How can I attach the signs? There are many ways, depending on the use, your facility infrastructure and building design as well as sign material allowance. It would be easier to discuss you exact situation with our team, so please feel free to contact us. How can I look after the lines once I have them? ‘Lift Clear’ – Ensure the forklift truck drivers and warehouse operatives lift pallets clear off the floor before maneuvering. ‘Clean Feet’ – Entrance mats can reduce the amount of dirt and debris carried in on shoes. ‘Floor Watch’ – Instill awareness in the workforce to remove debris and harmful objects when they are spotted. ‘Pallet Care’ – Removing or repairing damaged pallets will prevent them being dragged and gouging the coating. ‘Clean Care’ – The cleaner the floor is, the less abrasive items there are to wear the lines, maintain a cleaning regime to suit your operation. How can I stop the labels being screwed up on the floor? Floor labels become screwed up when MHE wheels are turned while on the label. The adhesive and materials are touch, but the twist pressure is extreme. Our online store provides customers with the opportunity to purchase standardized products. The same technology, production methods and quality control is used for our online products, so you can be assure you of their performance and durability.